In the engrossing Oslo, playwright J.T. Rogers dramatizes the secret back-channel negotiations that led to the Israeli-Palestinian peace accords of 1993. He makes diplomacy riveting by focusing on people, not politics. The adversaries arrive with a desire for peace but no trust in each other. Only seeing their counterparts as individuals keeps them trying, even when they cannot agree on a single sentence with the word "Jerusalem" in it. Oslo swept the best-play prizes in 2017, winning the Tony, Critics Circle, Drama Desk and Lucille Lortel awards. Northern Stage is presenting the regional premiere, and its fine cast of 16 turns a complex set of events into a gripping and passionate account. As one of humanity's most abstract ideas, peace might not seem a proper subject for drama. But director Peter Hackett keeps the tension crackling between characters who start off reluctant to shake hands and ultimately become lifelong friends. 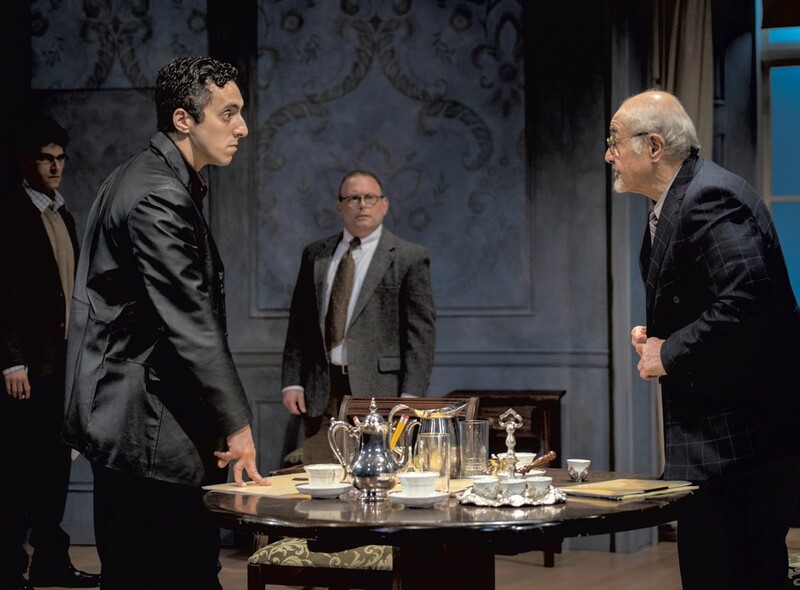 Based on true events, the play chronicles the talks between representatives of the Palestine Liberation Organization and the State of Israel. A Norwegian academic, Terje Rød-Larsen, and his diplomat wife, Mona Juul, orchestrated the meetings outside of official channels. The result was the 1993 agreement commemorated by a handshake between PLO chairman Yasser Arafat and Israeli prime minister Yitzhak Rabin at the White House. Though president Bill Clinton smiles behind them in the photos, the United States was not directly involved with the agreement. In fact, only by working privately could these two warring parties begin to bridge differences that literally forbade them to interact. The PLO was committed to the extermination of Israel; the Israelis were adamant about their right to hold land by force. Terje has no illusions about the difficulty of making peace between such intransigent parties, but he does believe his sociological insights can catalyze the process by encouraging the Israeli and Palestinian negotiators to treat each other as people, not alien enemies. By getting them to eat and drink together, Terje enables these men to make the human connections that motivate the compromises needed for peace. Their first agreement is about how delicious the Norwegian cook's waffles are. Though history shows that the 1993 accords did not result in lasting peace, the Oslo negotiations nonetheless demonstrate the highest potential for diplomacy. The participants must negotiate the very right to negotiate. At one impasse, Ahmed Qurie, the PLO's lead negotiator, demands to speak to Israelis with higher authority than the economists who've been representing Israel. Terje rashly bluffs that he can secure such a representative and then must make good on the precipitous promise. He ends up saving the talks by bringing in Uri Savir, a high-ranking member of the Israeli foreign ministry, but Terje's gamble was a big risk. Using quick scenes and forceful speech, Rogers unfolds the story with suspense. These characters interact in dialogue, not in windy speeches. The result is a sense of urgency that can keep an audience's rapt attention. Hackett emphasizes the physical gestures and distances that support or inhibit personal connections. The proximity of people is a functional barometer of psychological closeness, and Hackett's staging draws attention to the barren space in the meeting rooms that the characters must initially cross. To create that emptiness, scenic designer Rebecca Lord-Surratt and lighting designer Jennifer Reiser use a cool Scandinavian color palette in a room of formal European furnishings that are pushed against the walls until the actors themselves position chairs and tables. Projection designer Alek Deva fills the high, paneled back wall with occasional images that are sometimes subtle wallpaper suggesting the dozens of locations the play visits, and sometimes news footage that brings the violence of conflict right into the room. The brisk scene changes are illuminated only by light entering from open doors to offstage spaces, throwing the characters into backlit shadow as they enter and exit. Sound designer Jane Shaw fills these interludes with bold music, the equivalent of a cymbal crash capping each scene. The open space is also a form of pressure. As Mona reminds them, no one else is coming to help. In nuanced performances, this large cast works so well together that they can portray characters who move from confrontational to cooperative and back again. The play gives each of the characters a clarifying moment to shine, from the coy cook (Amanda Rafuse) to the high-strung Norwegian defense minister (Eric Bunge). All the actors perform with accents that distinguish their surface differences, from the guttural Israeli speech to the soft Arab consonants to the Norwegians' lilting formality. David Mason, as Terje, never lets the character's intellectual passion for peace completely outshine the man's egotism. Terje wants to be the center of attention yet must accept a role deep in the background of history, so Mason dips his head to cede the limelight but lets us see Terje's yearning to take credit. Mason is captivating. As Mona, Susan Haefner shows the character's wise willingness to take the expedient course. Sometimes she'll be the one to diffuse tension, but at crucial moments she pushes harder than anyone else in the room. Her poise is electric, her strength inspiring. As Uri, Matthew Cohn gives the character a rock-star demeanor. Tom Mardirosian plays Ahmed with gravity and dignity, thawing slowly from animosity to warmth. Dominic Comperatore burns with intensity as an Israeli legal adviser, and Todd Cerveris and Max Samuels play Israeli economists with welcome wit. The subject matter and three-hour running time may seem intimidating, but the performances are so propulsive that the show is entirely invigorating. Oslo does not take sides; no political group is right or wrong. Instead, it shows the courage necessary to look beyond a crippling history of hatred and toward peace. Correction, September 26, 2018: An earlier version of this story misidentified one of the actors playing an Israeli economist. It is Max Samuels. The original print version of this article was headlined "Making Peace"